People and organizations often describe themselves as being open and transparent. Social media enables one to see facets of a person or an organization, but not always the whole. The mind creates an image of the whole based on the collection of pieces, which may not be an accurate representation of reality. I was reminded of this on a recent visit to the U.S. Capitol in Washington, DC. 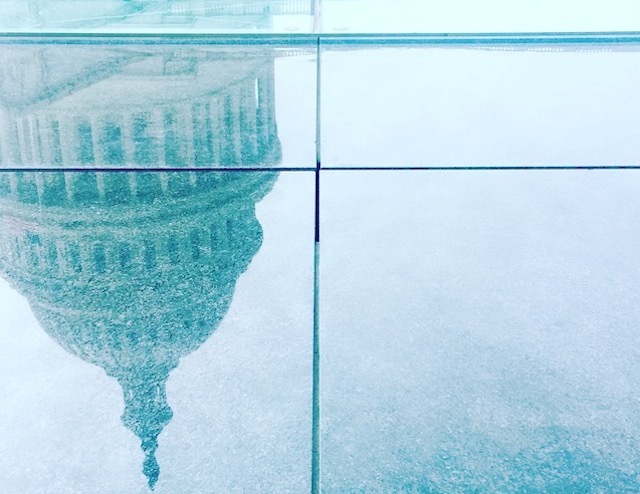 I was looking at the reflection of the Capitol Dome in the polished concrete and glass skylights in the plaza in front of the Capitol. A recent conversation with a colleague on reality and transparency in organizations reminded me of a classic book from architecture school: Colin Rowe and Robert Stutzky’s Transparency. In the book, the authors describe two types of transparency, literal and phenomenal, that exist in architecture and modern art. In other words, literal transparency is perceived and definite, and phenomenal transparency is conceived and indefinite. Making the jump out of architecture, could one say that something real is that which is perceived and definite? Can a mental construct that consists of pieces of the whole be real? Moving through life, I find myself creating strong and weak bonds with different groups of people and what is real is whatever I am focusing at a moment in time. Technology, in particular, has helped break down the barrier between what is literal and phenomenal, and fact and fiction are beginning to merge to the point where some may not be able to perceive the difference. In the connected and networked world, what I define as real is something that I can feel with one of my senses. I maintain working relationships with people around the world that I have never met in person. They are reliable and productive, but I truly don’t know them. Perhaps not knowing is absolutely fine in a society where technology has given people the ability to reach out and touch someone any time and any place. However, I believe people are looking for more than just access to others–they want quality connections. For me, the connections to people and places are what define our reality and help keep us grounded in a constantly shifting world.